Introducing the revolution in bike training with the Cycleops Phantom 1 Indoor Cycle. There are many Bikes in the marketplace but none provide the smooth feel of the Cycleops Phantom 1 Indoor Cycle. Rated highly by many users and Fitness experts gives this Bike the number one spot on our list for home and institutional use. 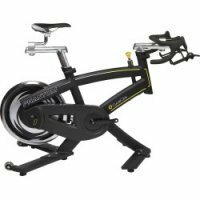 With its high quality and smooth feeling, its no wonder why many customers are buying the Cycleops Phantom 1 Indoor Cycle over other top name Brands. Cycleops Phantom 1 Indoor Cycle is becoming a leading indoor cycle in the fitness industry. You're Dedicated to Winning, Get a Bike Dedicated to Indoor Training. Our most affordable indoor cycle is built on our Pro Series frame, featuring freewheel gearing, and allows you to quickly adjust all geometric components necessary for creating the perfect fit. The Cycleops Phantom 1 Indoor Cycle also features intuitive-to-use manual resistance, dual bottle carriers and sleek stylish design. Because you want to get the most out of your workout without sacrificing most of your day you demand an indoor cycle that's easy to use, durable and as performance-focused as you are. The Cycleops Phantom 1 Indoor Cycle offers precise resistance control for a highly effective workout, with frame stiffness and stability that is second-to-none and freewheel gearing to make riding indoors duplicate the experience of riding your outdoor bike. To upgrade with speed and cadence sensors and a computer, purchase the Phantom 1.5 Indoor Cycle Upgrade Kit #7284. When your purchase this Bike you will have the ease of mind that assembly will be a pieace of cake. The unit already comes roughly 85% Pre-Assembled. As well as coming nearly fully assembled, a hardware package is included to help with the remaining assembly required. This video will demonstrate how easy it is to set up your Cycleops Phantom 1 Indoor Cycle. The Cycleops Phantom 1 Indoor Cycle is easy to maintain and clean. This video will demonstrate that to you. It's no wonder why this bike gets so many outstanding reviews. From its cool motivating style to its user friendly features to its adjustable flexibility, makes the Cycleops Phantom 1 Indoor Cycle placed into a category all by itself. With the Phantom 1 you get a gym-quality indoor cycle that can be easily adjusted to comfortably fit everyone in your household, including the ability to quickly change saddles and pedals. Finally it's easy to achieve high-level training goals in the comfort of your own home. The Pro Series frame offers freewheel gearing along with stiffness and stability that is second to none. Because you want to get the most out of your workout—without sacrificing most of your day—you demand an indoor cycle that's easy to use, durable and as performance-focused as you are. The Cycleops Phantom 1 indoor cycle offers precise resistance control for a highly effective workout, with frame stiffness and stability that is second-to-none and freewheel gearing to make riding indoors duplicate the experience of riding your outdoor bike. Once unpacked you are faced with a large bicycle shaped jigsaw puzzle that luckily doesnt have too many parts. Time taken to put the pieces together: 25 minutes and 23 seconds. Yes, we do put bicycle trainers together a lot here but it really is simple and you should be up and running on your new CycleOps Indoor Cycle within 30 -40 minutes. Fitness Warehouse is an Authorized Dealer for Cycleops Product. You will be receiving the full manufactures warranty. Your warranty covers all parts for 1 year and a lifetime coverage on bike frame.